Abstract - In the field of data center power, software tools play many roles, including data collection, analyzing power quality, switching loads, tracking long-term energy use and compliance, and, coming soon, arbitrage and billing for external power sources. Software-defined power, like the broader software-defined data center, is about creating a layer of abstraction that makes it easier to continuously match power resources with changing data center needs. 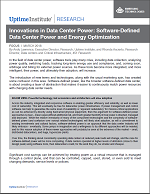 This 8-page report, produced by Uptime Institute Research in conjunction with 451 Research, investigates the business drivers, core technology and barriers to adoption of software-defined power in data centers.